This, the fourth day of my adventure, involved the move from Nelson, in the top middle of the South Island, over to the east coast, and down to the Kaikoura Peninsula—all told a trip of about 250 km. In the early morning, the low mists in the mountains outside of Nelson made driving interesting. The road through the mountains was very twisting and had numerous hair pin turns. Note the Lombardy poplars on the right—yet another introduced species. But then, toward the wine making region of Blenheim, the hills receded to the west, exposing flat lands that became more crowded with vineyards outside of the town. The hills around Blenheim are poorly consolidated clays and cobble, and are deeply dissected. The climate is fairly arid, and is reminiscent of the landscape of southern California, just behind the coastline. This topography didn’t change until reaching the South Pacific. But even here the hills crowd against the sea, with just enough room for a highway and railroad line. That’s my red car. Toward Kaikoura the landscape greens up a bit, and the shore becomes rugged, with lots of volcanic rock eroding at the shore. 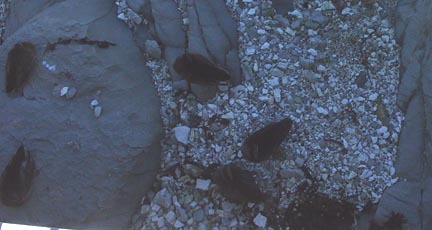 This region is a great one for breeding colonies of New Zealand Fur Seals. You can just make out some of the seals on the rocks in the center of the picture, but there are at least 50 seals here, of all ages and sexes—from pups to cows to bulls. Antarctic Fur seals have extreme sexual size dimorphism, with cows ranging from 45 kg to bulls pushing 450 kg. The New Zealand Fur Seal cows are larger, getting up to 100 or so kg, so the dimorphism is not as extreme here. At Kaikoura there is a peninsula jutting out for a few miles into the Pacific. 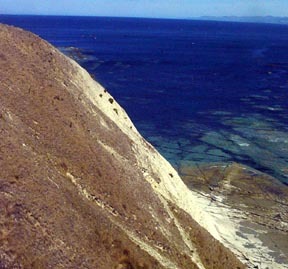 It has a high headland that was a sandstone based island. Fluvial deposition connected it with the mainland. The mountains that crowd behind it are the most orogenically active in today’s New Zealand, but the rate of erosion from them just about balances the rate of uplift. The tallest of these is about 2600 meters. Along the base many interesting sea birds are found—including Pied Shags (cormorants) and one of New Zealand's endemic ducks—the Grey Duck—here resting under a foot bridge. 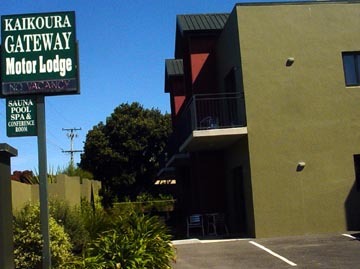 Tonight I get a good rest in my motel (Kaikoura Gateway Motor Lodge - 42o 24.199 S; 173o 40.794E; Elevation - 72') and tomorrow it will be a whale watch trip for Sperm Whales, and an afternoon fishing trip out on the briny.